Using a sharp knife, split the vanilla pod in half lengthways. Scrape out the seeds with the tip of the knife and mix with the mayonnaise and the soured cream, then add the diced salmon. Add a squeeze of lemon and stir to combine. 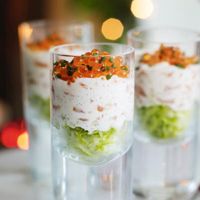 Put a little shredded lettuce in the bottom of 8 shot glasses, top each glass with the diced salmon and mayonnaise mixture. Garnish the top with a layer of rinsed salmon roe and sprinkle with finely chopped chives. Add soy sauce to the caviar for a burst of flavour. Carefully rinse the eggs in cold water several times until the water runs clear. Drain and add a few drops of soy sauce then place a little on top of each canapé.